Collectors of nice animals images, here you will find what your heart desires: some charming and amusing representations of your favourite pets on vintage posters. 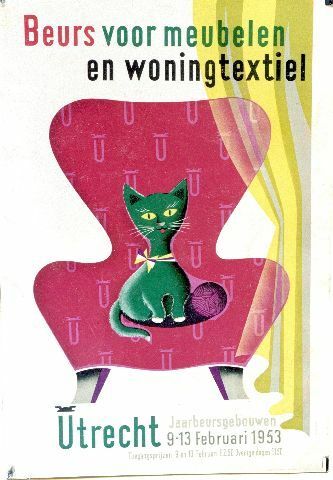 For cats’ lovers, look at the beautiful publicity for the Utrecht fair published in 1953. Amongst the famous designers great at picturing animals, the Swiss artists Herbert Leupin and Donald Brun have created several notorious images as the friendly cow for Liebig ( Donald Brun) or the wise elephant for Terlenka (Herbert Leupin). Travel posters are often using animals to promote their destination. 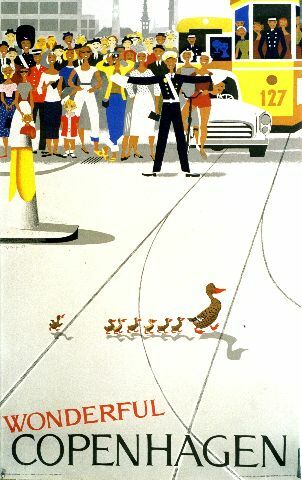 Ducks crossing a street advertise the city of Copenhagen, showing the gentleness of the people who let them walk the street in peace. A buoyant colt is playing with a little girl in Merano, Italy. A clever fox is enjoying the ski resort of the Swiss Wallis. A squirrel, on top of a pine tree, is waiting for travelers in Wengen, Swizerland. And do not forget the posters for the zoo….. Circus animals are also very popular in the posters world. Lions and bears, tigers and elephants, horses in full parade, all are symbols of the fantasy of circus. Publicity can be weird with animals: a drunken fish is promoting Vermouth Jaccobino, a seahorse invites you at a poetry contest, a herd of big elephants are announcing the next lottery prizes. You are currently browsing the archives for the Vintage Posters category.